In September, I'm hitting the road for a tour of the southwest United States! Many of my relatives live in a neat loop through these six states, so it worked out great to plot my tour along that path. 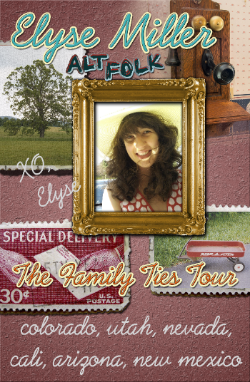 I'm calling this "The Family Ties Tour." I'm so excited to visit with my family and share my music with new audiences in foreign lands (like Utah!) The states I'm visiting are Utah, Nevada, California, Arizona, New Mexico. This is my first time playing in all of these states, so I'm counting on friends to help spread the word. If you know anyone in these areas who might enjoy my music, please tell them to check out my tour schedule! It is online at http://www.elysemiller.com/p/blog-page.html.